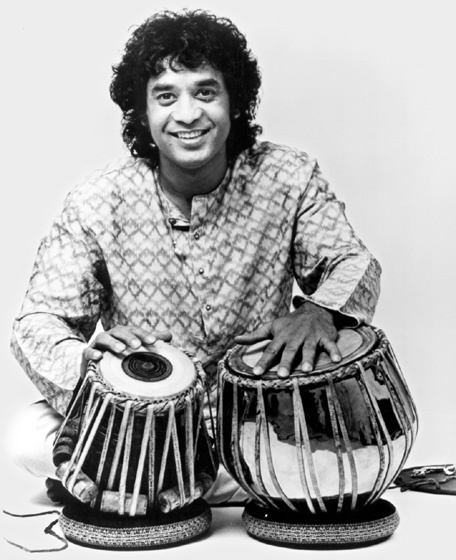 Zakir Hussain Allaraka Qureshi was born March 9, 1951, in Bombay, India. He is the son of Ustad Allah Rakha Khan, a well-known Indian tabla player. Zakir started playing the tabla as soon as he could reach across the drums. His study with his father was intensive: "You grow up in the atmosphere of music twenty-four hours a day," he said, "and you don't have to do anything else." Hussain began playing concerts by age 7 and and started touring at 12. The tabla was developed in the fourteenth century to accompany vocal, instrumental and dance music and is composed of two drums. One is called dayan (right), madeen (female), or tabla; the other is called bayan (left), duggi (male), or dhama. To play the tabla, the musician rests the instrument on the floor and sits behind it in a straight or bent position. He plays the left drum with his left hand and the right drum with the right hand. The left drum is made of wood, clay or copper hollowed out from the inside. Its shell is bored out of a single block of wood. The right drum is usually hollowed out of black wood. The bottom is broader than the top. Both are covered with skin fastened to leather straps, which are stretched over the body of drums by leather braces. These straps can be pulled to raise or lower the pitch. The musician plays well-established time cycles (talas) that are performed through drumming phrases (bols) called thekas. The tabla is deeply rooted in Indian tradition. Hussain is known as an innovator but sees a need to balance innovation with continuity: "You have to stay very close to your tradition, but also be able to inject some of what the world has to offer. It is time for Indian music to look outside rather than just to have the outside world borrow from Indian music." Tabla playing has hardly been static. Performing a raga involves improvisatory interplay with other musicians, which requires a keen intuitive sense. "The tabla player has an interesting job," Hussain said. "He is somewhat like a psychiatrist when he's onstage. He has no idea of what the main instrumentalist will do, so what he has to do is sit and wait onstage until the instrumentalist decides to initiate a composition. At that point, he finds out what he's going to do, what kind of mood he's in, what kind of temperament he has. In the first five to eight minutes, we must totally gauge what the musician is all about. We have to understand on the spot and analyze what he wants to express through his music. Or you might say I'm a catcher — but if the catcher didn't know what the pitcher was throwing, it would be a very different ball game." Hussain made his American debut performing with Ravi Shankar at the Fillmore East in New York City. While in New York, he met guitarist John McLaughlin, and their friendship led to the formation of Shakti, a musical group that also included Indian violinist L. Shankar. Over the years, Hussain has accompanied some of the greatest Indian musicians and collaborated with such diverse performers as the London String Quartet and Van Morrison. His 1992 album with Grateful Dead drummer Mickey Hart, Planet Drum, earned a Grammy Award and the Downbeat Critics Poll for best world beat album. He has contributed to the soundtracks of several films. He starred in the film Heat and Dust as well as playing music for it and was nominated for an award at the 1983 Cannes Film Festival for his musical contributions to that film. 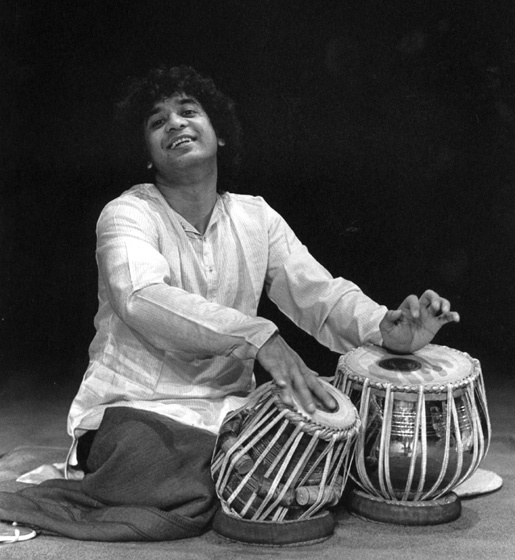 A year later, he started his own percussion ensemble, the Zakir Hussain Rhythm Experience. In 1991, he was awarded the Sangeer Natak Akademi by India's preeminent cultural institute, and in 1996 he was involved in composing music for the opening ceremonies of the Summer Olympics in Atlanta. Ouellette, Dan. "Percussion Maestros of North & South India & Pharoah Sanders." Down Beat (August 1996) 63, 8: 69. "Out of the Tradition." Down Beat (January 1993) 60, 1: 43. Hussain, Zakir, and Ustad Alla. Tabla Duet. Moment Records MR 1001. Hussain, Zakir, John McLaughlin, Jan Garbarek, and Hariprasad Chauraisa. Making Music. ECM 1349. Various artists. Saaz Tabla. Music Today, 2005. ____________. Saaz Tabla - Volume 1. Music Today, 2011. ____________. Saaz Tabla - Volume 2. Music Today, 2011. Contributions to sound tracks, including Apocalypse Now and Vietnam: A Television History.